This year, the Christmas season gave us an additional reason to celebrate — the wedding of Joan’s dad, Bob, and his fiancée, Cathy! On Friday afternoon, Joan and I drove up to Bob and Cathy’s house in Slatington, Pa., where we joined their extended family for a cocktail party in the evening. Thankfully, Michael slept very soundly overnight, and we all exchanged presents the following morning. By mid-afternoon, Joan and I packed the car and drove Michael to the Country Inn & Suites in nearby Lehighton, where the three of us checked in. Getting ready for the wedding on the evening of Dec. 27 — including getting Michael dressed in his first rented tuxedo — was a scramble, but we were still among the first to arrive at the Mahoning Valley Country Club. The ceremony was lovely, and Michael performed his duty as ring bearer very well! 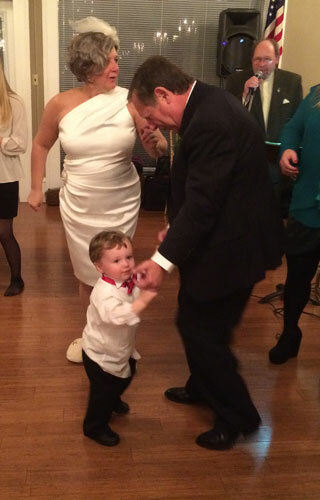 The reception and dinner immediately followed the ceremony, and the excellent live band provided plenty of opportunities for Michael to dance. We all slept very well on Saturday night, and made our return home on Sunday after brunch at the hotel. Congratulations to Bob and Cathy! Penn State’s 2014 football season is over, and it’s been a rough one. The Nittany Lions started out with a promising 4–0 record, but lost six of their last eight games to finish 6–6, their worst record since the dark days of 2004. Thanks to a surprising reduction in NCAA sanctions in September, those six wins make the Lions eligible to play in a bowl game. However, PSU truly earned its disappointing .500 record by finding new and creative ways to lose winnable games this year. Penn State suffered a surprising 29–6 blowout to Northwestern on homecoming weekend, a heartbreaking 31–24 double-overtime loss to 13th-ranked Ohio State that was marred by horrendous officiating (even with instant replay! ), and a narrow 16–14 defeat to Illinois, which had only won 2 of its previous 22 games against Big Ten opponents. Rutgers. During interviews prior to the game, Rutgers coach Kyle Flood cryptically referred to Penn State as “that team from Pennsylvania.” Flood never fully explained why he refused to utter PSU by name (as opposed to his other new opponents in the Big Ten), but his behavior struck me as insecure and disrespectful, especially for someone who should set an example for his players. Even worse, many Scarlet Knights fans brought offensive T-shirts and signs to the game, and Rutgers compounded the problem by posting photos of them on its official Facebook page. The pictures were eventually taken down. After all of that hostility, I was very satisfied to see Penn State get some revenge on the field with a 13–10 win in front of a record Rutgers home crowd. 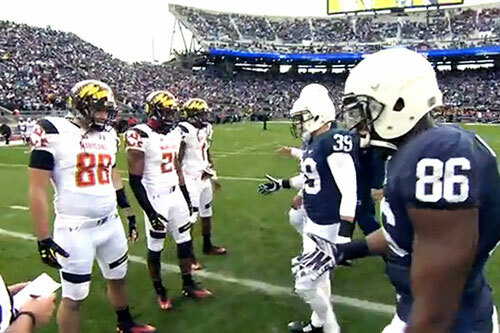 One of those Maryland captains, Stefon Diggs, even shoved a referee during a pre-game skirmish. The handshake stunt resulted in a $10,000 fine for Maryland coach Randy Edsall (who later offered a tepid apology), the shove eventually led to a one-game suspension for Diggs (which should have been an immediate ejection), and both incidents were reprimanded by the Big Ten. But unlike the Rutgers game, Penn State suffered a bitter 20–19 loss to Maryland, thanks to a last-minute field goal. In the wake of these incidents, the athletic directors from Rutgers and Maryland both issued a apology to Penn State. Honestly, I can’t recall the last time that an opposing team needed to formally express regret for its actions, let alone twice in a single season. But since both Rutgers and Maryland are located geographically close to Penn State and seem motivated to spark a rivalry with their new conference neighbor, I can only assume that both programs were quite deliberate in their efforts to “poke the bear” in their matchup against PSU. Respect must be earned over time, and Rutgers and Maryland have demonstrated that they have a long way to go in that department. But if their goal was to provoke Penn State fans like me, both programs have succeeded in their mission. Rutgers and Maryland have joined the ranks of the few teams that I genuinely hate, and from now on, I hope Penn State soundly defeats them year after year — while maintaining a high level of sportsmanship, of course.